Say it with me now: piracy is bad. There are ways to get free copies of just about everything online, but even setting aside the legal and moral aspects of it, doing so can come with the risk of infecting your computer with something icky or falling victim to a phishing attempt. People who know their way around the woods will continue to be able to take advantage of things, but Google's working on reducing the likelihood that the average user will end up in a place they don't want to be. The search giant is doing its part by placing greater emphasis on legitimate means of downloading or streaming media. 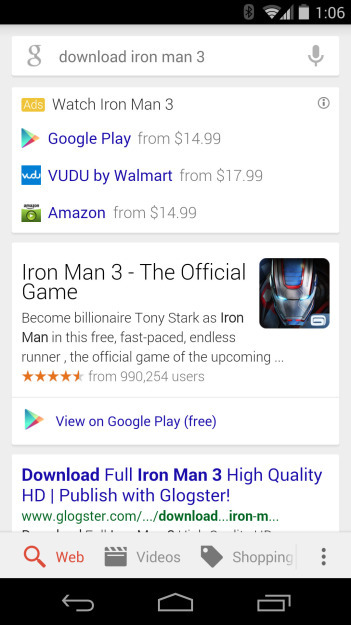 People in the US who use the terms "download," "watch," or the like when searching for a movie have begun to see an ad box appear at the top of their search results linking them to Amazon, Google Play, Hulu, Netflix, Vudu, and similar stores where the content is available. Here's how it looks both on a desktop and on a mobile device. These links are also available among the information that appears in the right-hand panel next to results, and Google is working to do something similar with music. These efforts should help point people who want to abide by the law in the right direction. As for the people who aren't as concerned about obeying the rules for one reason or another, Google is introducing changes that will make it more difficult to discover sites that are being hit by DMCA removal notices. The company has started to remove autocomplete predictions that point towards those destinations. It is also rolling out an improved DMCA demotion signal that it says should visibly affect the ranking of sites that are hit with a large number of valid DMCA notices. If you want to dive deeper into all this, take a look at the complete How Google Fights Piracy report.